We know that it can be hard to research all of the information needed to make a good decision on buying or selling your home in Rexburg and East Idaho. The real estate research tools on this page should help you get a good start on finding the information you need, or at least help you find the right questions to ask one of our agents. We pride ourselves in providing quality customer service and support to our clients. If you don't see what you need, give us a call. If you would like to schedule an appointment to discuss selling or purchasing a home or investment property, give us a call at 208-356-7300 or email infodesk@countrywideprop.com. 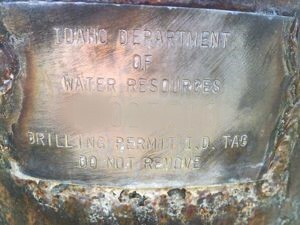 In the state of Idaho, every domestic well must have a well tag. The well tag is usually found on the well casing. It will look something like the picture here. Take a picture or write down your well tag number and visit this link. You will be able to enter you well tag number and learn the history of your well. Finding water rights for a particular property can be tricky. There are many types of water rights. There are ground water rights, wells rights, canal shares, and more. The easiest way to find water rights is to begin with the Idaho water resources interactive map. When you open the map, it is going to put you right in the middle of the state. You will need to zoom into the area you would like to research until you find the parcels you need information on. When you find the parcel, click on it. A pop up dialog will come up with a heading that says something like X of X. This pop up will provide you with the owner, most often a canal company, the type of water use, and important dates about how old the water rights are. If the owner is a canal company you will need to look up the company and call the secretary to discuss the shares allocated to the land. The latest water company directory can be found online. Some developments and properties come with covenants, conditions, and restrictions. Commonly referred to as CC&R's these documents outline how the bundle of rights associated with the land have been restricted. It is very important to understand the CC&R's for a property you are considering purchasing because the document is a legally binding agreement that you agree to follow if your purchase land in a home owners association area. One example may be chickens. Many cities limit the number of fowl in residential areas to six or eight chickens. However, if your future home is in a neighborhood governed by CC&R's, there may be a provision in the agreement disallowing any chickens. In most cases, you will have to abide by the rules and go without those fresh eggs. You can try a search now by clicking the link below which will take you to the fine people at First American Title. Sometimes it may be necessary to find the contact of property that is owned by a corporation or LLC in the state of Idaho. Many properties are owned by business entities and the contact information may be difficult to find using only the GIS system. If the GIS shows a corporation or other business entity in Idaho as the owner, you can use the link below to look up the business entity. Each record has a contact person listed. East Idaho is a great place to live and work. It covers a large part of the state, with Clark County and Fremont Couty to the north, Oneida County and Franklin County to the south, and Teton, Fremont, Bonneville, and Caribou County to the east. The region is home to BYU Idaho, Idaho State Universtity, and the Idaho National Labs. But this part of Idaho is not all about work. In the summer this area is a great place to hike, fish, ride ATV's through the mountains, swim, and enjoy the outdoors. In the winter, the region becomes a winter wonderland with hundreds of miles of snow sled trails, skiing, ice fishing and more. One of the benefits of East Idaho is the cost of living. Homes are affordable and most areas have employment opportunities to provide a good living for residents. Here are some other facts about the area.